My husband has been an avid cyclist since his childhood. He remembers sitting in the Scout Hall in the late 60’s to watch 8 millimetre movies on the Tour and the Giro that the “lucky old hands” had shot during their trips to Europe – by sea (which also tells you how old he is!). He never thought that he would be fortunate enough to go and see these races live, nor that cycling would become such a followed sport in Australia (he used to get teased about his shaved legs…often), or that we would end up having a Tour de France winner or our very our own cycling team. And of course he never thought he would marry an Italian who knows nothing about cycling. The amazing thing was that not only did I enjoy the movie, I also found some great reminders on how to build and maintain successful teams – so here they are – apologies to all of those cycling enthusiasts in advance as this is more a focus on team building and the things that I found inspiring than on cycling itself. One of the things Orica GreenEdge did was start shooting small videos that they would then upload on YouTube called “Backstage Pass“. In these not only did they advertise their team, they also showed the riders as people and how they could have an amazing fun time despite the pressure and fatigue. The “human” side comes out often in the interviews and how their “humanity” has helped them through the tough times as well as the successes. These videos allow us a glimpse exactly into that, which of course includes disappointments, frustrations and …successes. If you haven’t seen the videos go and take a look because even for non-cyclists like myself they are great fun. So how do we allow individuals to express themselves and shine through adversity? Adding fun and allowing people to be themselves seems like a good start. The best interviews throughout the movie are with someone who looks like a little kid. His name is Esteban Chavez, he is from Colombia and his story is amazing. When he was contacted by Orica GreenEdge he had had a life changing accident that had left him in a coma and subsequently nerve damage to his shoulder that was not healing. The team saw the potential in him, had him join the team and invested in him, until he proved himself with an astounding 2nd stage victory at the Vuelta de Espana in 2015. The interviews with him and his parents are the most touching throughout the movie. When you believe in the Talent of your team members amazing things happen, and what happened to Mathew Hayman another member of the team is perhaps even more incredible. Cycling is a sport for people who like pain, or at least that can deal with pain over long periods of time. Paris-Roubaix is one of those classics that show you the pain even when you are watching it from home. Mathew Hayman (37 years old and team support rider) had ridden in it 15 times before. Six weeks before the 2016 edition he broke his arm in another race. Six weeks later he won this race, the toughest race on the cycling calendar – despite all odds (including the fact that he had been dropped during it which in this race means you can’t catch up). So believe in all of your team because in times such as this, hard work and determination breed success, especially against the odds, even team members that have always been “supporters” (or “domestiques” to use a cycling term) and may be close to the end of their career. And what a difference doe their success make to the rest of your team! 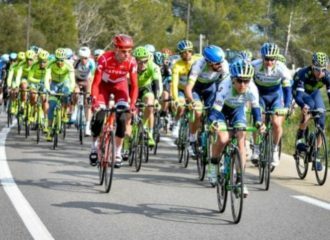 We all talk about sharing success – however, what Simon Gerrans did in the 2013 Tour de France gives it an even deeper meaning. Simon was the lead man – team captain – for the Orica GreenEdge team and in 2013 he, along with the team won the time trial and consequently the Yellow Jersey as leader of the Tour de France. Again, I do not know much about cycling but even I know that it is a BIG deal. The attention is all on you – you feel like you are on top of the world and everyone thinks you are. Cyclists that get the Yellow Jersey try and keep it for as long as they can, even though they know they may not win the Tour. So what did Simon do? He walks in the tour bus after this exhilarating experience and tells his team mate Daryl Impey “tomorrow you get to win the Yellow Jersey”. And that is exactly what happened. They worked to make sure that the next day Impey was the one in Yellow. This takes the sharing of success to a much deeper lever – it means allowing your team mates to have their own victories even when you could be the victorious one. Personally I have not had the opportunity to experience this type of generosity often – but I can just imagine what this can feel like both for the giver as well as the receiver and the type of emotions this would create in the team. This is taking celebrating success to an all-new level. All of these things created a truly inspiring team that achieved unbelievable goals, permitted individuals to shine by believing in them and at the same time allowed them to be themselves while having a good time. Now, who wouldn’t want to be part of this team? Contributor: Our featured member, Paula Liverani-Brooks, is an HR consultant and executive coach. ← Now that you’ve hired your talent, what happens next?